Vibration of breathing, dull ache of traffic. Wired bird claims its territory. Hi Ann Rapstoff here, this is a blog about writing momentary micro observations of life as it unfolds. I am an artist, coach, counsellor and student of life. I use words as a way of making images and sketches, writing enables me to play, develop ideas, communicate and record life. I thank my friend Fiona, who is a writer and blogger for galvinising me to get this going. Her daily practice of writing is a way of articulating the world around her. Do log into Fiona's blog and have a rummage, there is lots to explore. My art practice is not necessarily about making and its not so much materials either, although I dabble. It's a committment to living through really observing, moving through my body, interacting, communicating and experiencing. As this blog develops I hope you will join me and enter in the journey. 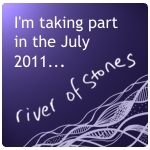 Thanks so much, Fiona and Kaspa for offering me the opportunity to make my words public through Their development of a A River of Stones, throughout January and beyond, all are welcome. You can see some of my other work about spaces and places and more of my general artwork.